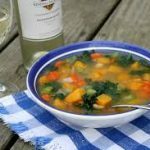 This Kale and Roasted Vegetable Soup recipe is a flavorful way to incorporate more fiber into your diet and not only that but it is really good! Lightly oil a rimmed baking pan. Arrange the carrots and squash (or eggplant) on one end and the onions, garlic and tomato on the other. Roast until everything is slightly browned, around 30 minutes. Scoop the onions, tomatoes and garlic into a blender. Puree the vegetables briefly. Add the stock and mix briefly. In a large saucepan, bring the stock with blended veggies to a simmer. Add the kale, thyme and bay leaf. Cook until the kale is tender, about 30 minutes. Add the carrots, squash (eggplant) and white beans. Cook for about 5 more minutes. Remove the bay leaf and the thyme sprigs, if you used fresh thyme.